Since 1996, Holiday Stockings for Homeless Children has been sewing, filling and delivering holiday stockings full of new small gifts and toys for homeless children in the Puget Sound area during the holidays. Holiday Stockings was the brainchild of Ms. Jan Maxson, the wife of a member of the US Coast Guard. In 1994, Jan was moved to do something for the homeless children of New York during the holiday season, so she decided to provide them with handmade stockings filled with toys. That first year, a group of volunteers was able to donate 300 handmade stockings to children in shelters in Harlem, Lower Manhattan and Staten Island. In 1996, the Maxson family moved to Seattle and the Holiday Stockings project found a new home at the Coast Guard based in Seattle. Today, the Holiday Stockings program is run by an all-volunteer Board of Directors that is comprised primarily wives of retired and active duty Coast Guard personal and friends. It is now called the Coast Guard Family and Friends Holiday Stockings for Homeless Children. Together, these women and over 800 volunteers have grown the organization into one that now serves nearly 4,500 homeless children living in over 92 shelters up to 800 homeless street youth per year. Over 52,000 stockings have been filled since 1996 and our service area runs from Everett to Tacoma and North Bend to Port Angeles. 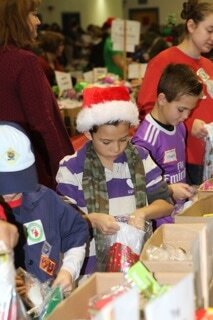 Throughout the year, volunteers sew stockings distribution to shelters in mid-December. Holiday Stockings provides each volunteer with a pattern and holiday fabric to ensure uniformity of shape and style. A simple stocking pattern is also available to volunteers wishing to use their own materials. Volunteers also knit hats and make bibs for use in age appropriate stockings. Please go to Ways YOU can help > Sewing and Knitting for additional information. Each November, the Holiday Stockings organization begins contacting social services agencies in and around the Puget Sound area. Volunteers request the age and genders of the children in each shelter so the stockings will meet the needs and wishes of each child. Each stocking will be filled with assorted new items such as socks, toys, games, books, hygiene items and other small gifts. The annual sorting and filling of the stockings takes place on the second Friday and Saturday in December. Volunteers from within the Coast Guard and others from the Seattle community at large will come together in the Gym at the Coast Guard Integrated Support Command on Pier 36 in Seattle to fill stockings and deliver them to area shelters.